This dialog contains all filter expressions that have already been defined. Opens a dialog where the new filter expression can be formulated. 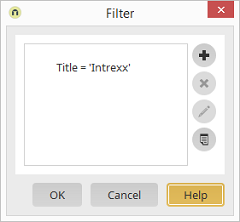 Opens a dialog where the currently selected filter expression can be edited. Opens the filter editor where the filter's XML can be edited directly.